Well, hello! Welcome to the CEDRIC Centre blog and on-line community. Today I had an interesting experience on the way in to work. I had just pulled out of my driveway and was making a left turn onto a moderately busy road, had checked both directions and started pulling into traffic. Suddenly this SUV is right in front of me, he must have been speeding to have come upon me that quickly. He slammed on the breaks, rolled down his window and started yelling and swearing – lots of f- this and f-that – how stupid I am, how I have no right to be on the road etc. etc. Now keep in mind that I didn’t hit him. I didn’t even come close as I saw him about 5 feet before I would have pulled into his lane and braked. He didn’t have to swerve to miss me. Keep in mind also that my kids were in the car and that his were too. As this was all happening I noticed something really amazing. I was calm. I smiled at him and waved and said, sorry, have a great day! He gave me not only the finger but the loser sign! I couldn’t help but notice again how calm I was. I wasn’t panicked by the near miss or by his assault. I wasn’t embarrassed or humiliated or shamed. I was concerned for the kids having heard this barrage. (Bless them, they were oblivious of the whole thing as my son was entertaining my friend’s daughter by sticking Kleenex up his nose and pretending it was a moustache! A young comedian in training!) I was sad for his daughters in the back seat having to experience his anger and tension. It also struck me that the strength of his reaction means it must be hard for him to allow people to make mistakes and I felt some sadness for his kids again. How hard it clearly was for him to forgive and to see people as humans, doing their best and definitely imperfect, in a situation that really wasn’t life threatening and was not harmful to anyone. I wondered if there was any part of him that was willing in his own mind to acknowledge that he had been speeding and that that was his contribution to the near miss. I guessed not. But that thought about forgiveness and allowing others to make mistakes; allowing myself to make them, really stuck with me. You see if that situation had happened a few years ago, while I was still healing the bulk of my tattered self-esteem, and still desperately seeking outside of myself for the approval of everyone and everything, I know exactly how I would have felt. I would have felt panicked. My heart would have been pounding. I would have felt scared that he was going to hurt me physically and I would have felt hurt emotionally by his judgement of me as an f'in *^*# (rhymes with ‘runt') and a loser. I would have felt ashamed and embarrassed and humiliated, bad and wrong. I would have flushed and I would have responded with anger myself. Giving him the finger back and then feeling even more fearful of retaliation. I would have been angry with my kids if they mentioned it or asked why I had made the mistake I made. I would have been unable to take responsibility for my role in the near miss and would be blaming him entirely. I would be sitting here now an hour and a half later feeling diminished and hurt and angry and needing someone or something to bolster my self-esteem or to calm my emotions. Out would come the food. I certainly wouldn't tell anyone about the fact that I almost cut someone off in traffic. I was incapable of allowing myself to be human. It had never been safe to make mistakes in my home. I was shamed, berated, humiliated, and some times beaten for small accidents like spilling milk or leaving my shoes in the front doorway. It wasn't safe to be imperfect. That was a big part of why I had such a hard time letting go of my use of food to cope. I used food to cope with my feelings of anxiety that were triggered by my belief in my own fundamental "wrongness" or inadequacy and so as long as I still felt bad and wrong and inadequate and imperfect I was anxious and needed to numb out. I also believed I needed to look a certain way in order to finally be perfect and therefore gain the love and approval and safety that I so desperately sought. But what I didn't realize was that I was constantly undermining my sense of safety in the world by putting what others thought of me ahead of my own sense of self. Even when I was honoring my core values and being honest and caring and respectful to others, when I was working and paying my way in the world and doing my bit for the environment I still believed that I wasn't "good enough" if everyone else didn't like me, all the time. The only way a person can feel, when they are looking outside of themselves for validation of their "okay-ness," is anxious. And when humans feel anxious for too long or too much of the time they need to distance themselves from that distress through any means available. They may get drunk, high, steal, gamble, engage in promiscuity, binge, purge, restrict, exercise excessively, isolate, procrastinate, sleep.....and a number of other harmful ways of coping with anxiety. What if instead of just coping with the anxiety you actually cured it!? What if instead of giving yourself a daily or hourly bandaid you healed the wound entirely? That's what I did. And that's what you deserve too. 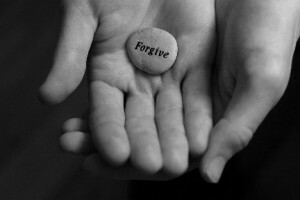 You deserve to make mistakes and to forgive yourself and be forgiven by others. You deserve to feel peaceful and happy in the world wherever you are. You deserve to be treated with dignity and respect. You deserve to be loved for who and how you are right this very minute. There is a solution. My drive in to work today really showed me how incredibly far I have come. It was my goal many years ago to reach a place where people can be angry with me and I don't take it on; I stay solid in my love for myself and in my respect for myself while at the same time acknowledging their right to think and feel what they think and feel (People can and will think what they want, I just don't have to hang around and take it as I used to believe). We'll always make mistakes people. We're going to screw up from time to time. We deserve to be treated with dignity and respect regardless. We deserve to be given second chances and shown forgiveness and love. If the key people in your life were unable to allow you to make mistakes or to be anything less than perfect that is a reflection of their own low self-esteem and their own pain and wounding and not a reflection of your worth or acceptability. We deserve to love and accept ourselves completely regardless of what others think and feel about us. As long as we take responsibility for our actions and work to make amends where necessary we are doing our best for ourselves and for our society. That's all anyone can ask of themselves and of us. How ready are you to allow yourself to be imperfect and to love and accept yourself completely anyway? How ready are you to practice forgiveness for yourself? Would you like to learn how? Would you like to live from a place of inner strength and dignity and peace? If so, send me an email or call and get started on the next phase of your journey. Love Michelle P.S. If you like what you read here and want to stay connected make sure you register for our free on-line newsletter so you can receive weekly updates and articles that will support you to be the best that you can be in all ways!